No one can accuse me of being a picky eater. I like everything. My sister, however, has always been the opposite. At first she didn't like vegetables, and made my parents make chicken tenders for her every night. When she became a teenager, she changed gears entirely and became a vegetarian. While she's back to eating bacon and chicken again, I've seen enough tantrums about picky eating to last a lifetime. If you've got a kid who is a picky eater, here's a few fatherhood ideas to keep in mind. Don't force food when they're not hungry – One of the main reasons kids may not be all that interested in eating is that they're actually not hungry at that point in time – which is fine. Don't force them to eat "right then" if they don't want to. Just ask them to sit at the table with everyone else, and they can heat their dinner back up when they're ready to eat. Try new foods more than once – Kids may not like new foods the first time. So don't be afraid to try them more than once. 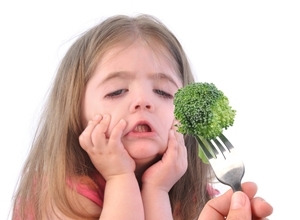 Kids actually have more taste buds than adults, so strong flavors may be even more intense. Tune out table distractions – Would you rather eat something you aren't excited about, or spend that time watching television? Your kids' answers are probably going to be very similar. So unless it's Super Bowl Sunday, try turning off the television during dinner, and keep the phones away. Remember, if you want your kids to do it, Dad needs to lead by example. So when you're at the table, don't check your emails or texts. Either wait 10 minutes, or walk away from the table before you pull out your iPhone. Get creative – If you're having trouble incorporating certain foods into your kids' diets, try getting creative with its presentation. For instance, put veggies inside pasta sauce, rather than on the side. You can also try to balance out bitter flavors by adding some sourness – like putting lemon juice on broccoli. Hand over control – Want to avoid the "I don't want to eat that" debate? Put your kids in charge sometimes. Whether it's helping create the dinner menu for next week, or even having a make-your-own taco night, giving them choices can help make things run a lot smoother. Make food fun – When catering to kids, keeping things fun can also help encourage your kids to eat more veggies. (After all, why do you think companies make dinosaur chicken nuggets?) There's actually proof to back it up too. Researchers at Cornell found that simply by calling carrots "X-ray Vision Carrots" at a school, children ate twice as many of them. The key to overcoming picky eating is persistence. Avoid making individual meals regularly – letting your child turn you into everyone's personal chef is a bad road to start down. Once you begin to cave, you're setting a precedent and encouraging the picky eating to continue.